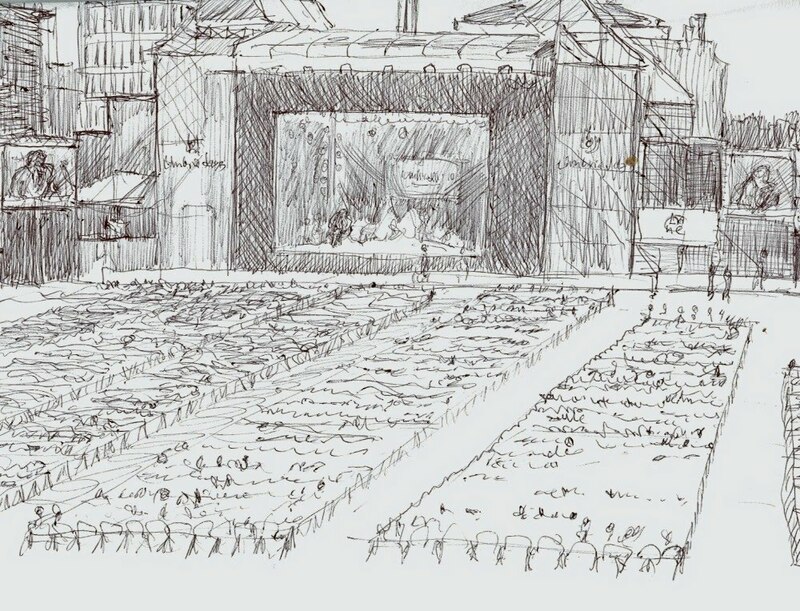 In the course of attending Umbria Jazz for the past thirty-six years, I’ve developed the habit of sketching musicians as they perform, wherever that may be. 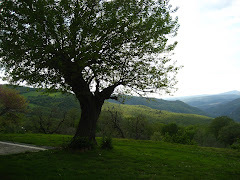 This season, most of the sounds I’ve heard have emanated from the legions of grandchildren making pilgrimages to the family home, but on Friday, July 16th, I managed to slip out to Perugia for some music. Too late for the Roberta Gamberini concert, not inclined toward the over-elegant confines of the Hotel Brufani to hear Hilary Kole sing, and confused about the whereabouts of the Funk Off concert, I just had an ice cream and waited for the concert I’d come to Perugia for, that of Sonny Rollins. What I saw is documented in the drawing here, and what most of us there really couldn’t see, appears in the photo. What I heard was something else again. Rollins started the concert with a long, raucous number that could have been the death rattle of some aging beast. Not an auspicious start, but as he played on, the power and the beauty of his music emerged. He is indeed a beast. He turns eighty on September 7th and while his walk gives away his age, his energy and creativity never abate. Backed by a four-man rhythm section of guitar, bass, drums and conga drum, Sonny Rollins played virtually non-stop, pausing only briefly for an occasional solo by guitarist Peter Bernstein. The concert featured standards from his repertoire of recent years, but some of the titles seemed particularly timely. He hit his stride with a thoroughly unsentimental version of Duke Ellington’s In A Sentimental Mood and went on to his calypso classic, Global Warming. Rollins was born in Harlem to parents from the Virgin Islands and his affinity for calypso songs runs deep. Despite a harebrained US Senator erecting an igloo on the Washington Mall last winter to mock the concept of global warming, this has been the hottest first six months of the year since measurements were kept. The 32-35° temperatures (90-96 American degrees) in Perugia kept Corso Vannucci, normally carpeted with people at this time of the year, looking semi-deserted. 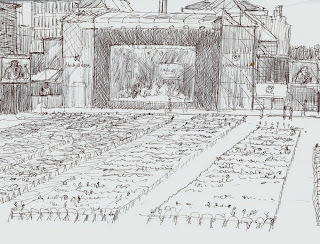 Nevertheless, the huge Arena Santa Giuliana was ¾ full to hear the Saxophone Colossus, and while the hellish temperatures had abated somewhat with the sunset (the sun-baked concrete seats retained their heat), Sonny Rollins played without a break from 9:45 until midnight. Sonny arrived on the jazz scene in the 40’s and 50’s, playing with Bird, Diz, Monk, Miles, Trane, Bags, Dexter, Stan and Bud. He’s survived all of them, as well as his wife of forty-six years, Lucille. She was also his manager, taking care of everything but the music until she died in 2004. He’s had to adjust, but he keeps on going, playing these Olympic–sized concerts. Five days before Perugia he played in Rotterdam and four days after the Perugia concert he was scheduled to play in Norway. 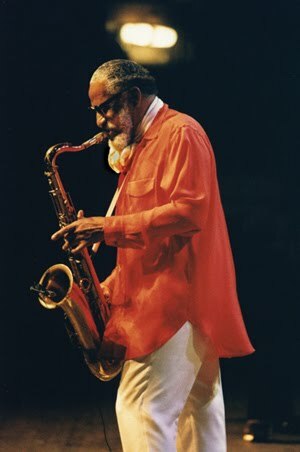 One of the last songs of the concert was “Why was I Born?” It’s a question that most of us ask at some point and one that Sonny Rollins has asked more than most. He’s found his answer. Sonny Rollins is here to play his music.